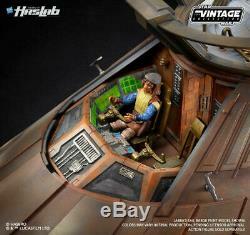 Star Wars The Vintage Collection Jabba's Sail Barge (The Khetanna). For years, Star Wars fans have yearned for the creation of Jabba's Sail Barge to add to their collections but couldn't due to no availability in the uk or Europe, Dark Side Toys Decided thats not fair and took it on ourself to bring it to uk & Europe. With your support, the time has come to back this project. Intricate detailing, premium materials, superior functionality and grandiose size. 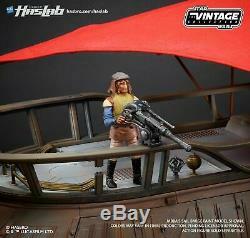 It is poised to be one of the most sought after, must-have items in the Star Wars collection. Who wouldn't want one of these in your collection, Modern or vintage collector. Total length: 49.35" Total width: 14.64". Total height (to top of sails): 17.01 Total weight: 13.89 lbs. Includes Jabba the Hutt 3.75-inch scale figure. 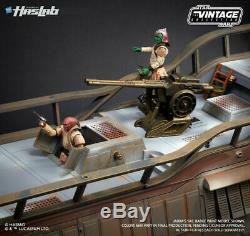 The Vintage Collection Jabba's Sail Barge (The Khetanna), complete with exquisitely-detailed and fan accessible interior/exterior decks, two soft-cloth fabric sails, and other realistic features that mimic one of the most notorious vehicles in the Star Wars universe. 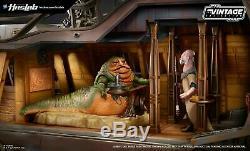 Jabba the Hutt 3.75-inch scale figure. Classic Vintage Collection packaging with special limited edition HASLAB seal of authenticity. In the film "Star Wars: Episode VI Return of the Jedi" , The Khetanna was a luxury, 30-meter sail barge owned by Jabba the Hutt that carried a massive transport of up to 500 passengers and 26 crew members. Complete with 3 decks, the Sail Barge was primarily used to transport passengers on extended trips across the dunes on the planet, Tatooine. Most notably, the Sail Barge was the site of Jabba's demise at the hands of Princess Leia Organa and her cohorts. 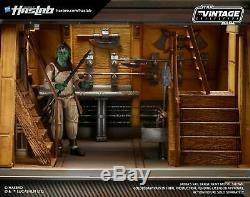 The item "Star Wars The Vintage Collection Jabba's Sail Barge (The Khetanna)" is in sale since Friday, March 29, 2019. This item is in the category "Toys & Games\Action Figures\TV, Movies & Video Games". The seller is "valentino_dealer" and is located in Uxbridge. This item can be shipped to United Kingdom, Austria, Belgium, Bulgaria, Croatia, Cyprus, Czech republic, Denmark, Estonia, Finland, France, Germany, Greece, Hungary, Ireland, Italy, Latvia, Lithuania, Luxembourg, Malta, Netherlands, Poland, Portugal, Romania, Slovakia, Slovenia, Spain, Sweden, Australia, United States, Brazil, Japan, New Zealand, China, Israel, Hong Kong, Norway, Indonesia, Mexico, Singapore, South Korea, Switzerland, Taiwan, Thailand, Bangladesh, Bermuda, Bolivia, Barbados, Brunei darussalam, Cayman islands, Ecuador, Egypt, Guernsey, Gibraltar, Guadeloupe, French guiana, Iceland, Jersey, Jordan, Cambodia, Liechtenstein, Sri lanka, Macao, Monaco, Maldives, Martinique, Nicaragua, Oman, Pakistan, Peru, Paraguay, Reunion, Saudi arabia, South africa, United arab emirates, Ukraine.